To churn out all these predictions by Opening Day I can’t really take time to think, which is not necessarily a bad thing given that I am not a good thinker, so here go a few random thoughts on this 1979 Ron Pruitt card. 1. What was it with masked professional-athlete Pruitts in Cleveland in the late 1970s? I’ve never come upon the name Pruitt anywhere else, yet in 1979 the Cleveland sports landscape was lousy with Pruitts in helmets, current star Mike Pruitt and former star Greg Pruitt running the ball for the Cleveland Browns while Ron Pruitt filled in once in a while wherever he was needed by the Cleveland Indians. None of the Pruitts were related, which seems somehow unfair. 3. This past weekend my wife and I started packing up our apartment to get ready for a move. As we were putting books into boxes, we had half an eye on Major League, which had presumably been rushed onto the air to grab a piece of the Charlie Sheen mania sweeping the land. The movie features Charlie Sheen as a flamethrowing rookie phenom leading the Cleveland Indians to a dream season. I have seen it before and experienced most of it this time as background babble while working on clearing my shelves. It’s a strangely exhausting task to pack up my books, as each one of them seems to exert a pull on me, similar in some ways to how my cat reaches up and paws at me, purring, wanting my attention. It doesn’t matter whether the book is one I’ve already read or one I’ve been meaning for a while to read, if I so much as touch the cover the book will beg me to drop everything and sit down and read the entire contents, and after a while these unheeded pleas take a psychic toll. So I took a lot of breaks while packing up my books, collapsing on the couch not to read but to watch a young, skilled Charlie Sheen throw the most plausible fictional heaters ever to grace the big screen. 4. The movie version of the Cleveland baseball team echoes the actual version in being mired in decades of losing. Ron Pruitt was on hand for some of that losing by the real baseball Indians, who were of course named after another beleaguered group long familiar with losing. Even before those first Indians started losing great swaths of land and people, before they were given the dubious misnomer used to identify collectively the many indigenous tribes that occupied the continent, those tribes had, I believe, an awareness and even an acceptance of losing being a natural part of life. Because of this, they lived on the land in a more sustainable way, more in tune with the necessary balance between losses and gains, than the Americans who would crowd them out with a hungering expansionist need to always be gaining and winning. 5. Charlie Sheen is the ultimate American. And no matter how much maniacally focused conviction this ultimate American (whose primary catchphrase—“winning”—centers either the most public nervous breakdown yet or an improvised straightfaced multimedia comedic performance that would have made Andy Kaufman writhe in admiration and envy) can pour into the message that his life from now on will only be about gaining and sustaining victory, he will lose, because we all will lose, because at a certain point we will run out of time to do all the things we wanted to do and go all the places we wanted to go and read all the books we wanted to read, and we can feel this certainty tugging at us at various times, such as when we pack books into boxes in a dress rehearsal for the packing chore that will happen eventually, somewhere down the line, without us. Winning only solidifies into permanence in the movies. In real life, it comes and goes. 6. 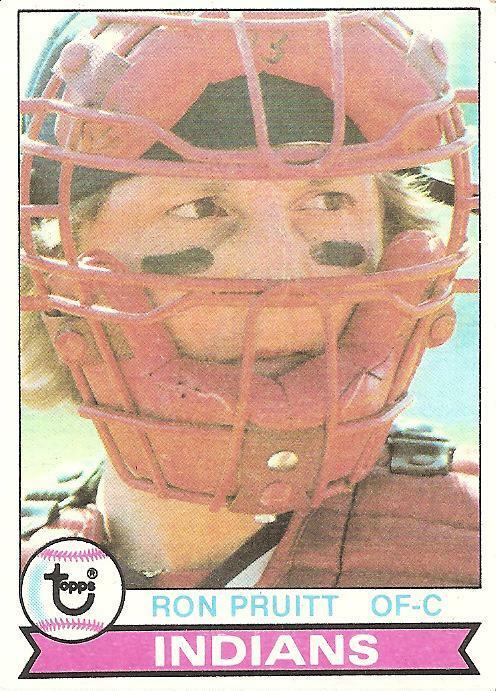 Ron Pruitt seems to be watching it go in this 1979 card, from behind his protective mask. He was paying attention throughout his career, it seems, and like another major leaguer who learned to exist at the margins, Mike Kingery, Ron Pruitt now teaches the game to anyone who wants his instruction. 7. The 2011 Cleveland Indians will ramble like these thoughts, and stumble through occurrences as unrelated as the Cleveland trio of Pruitts, and continue their long relationship with that certainty of the human experience, losing. How to enjoy the 2011 baseball season, part 9 of 30: read Eric Nusbaum’s Pitchers and Poets, a site that, as Howard Cosell once said admiringly of Frank Sinatra, “knows what losing means.” Nusbaum’s “Death of a Pitcher” post was included in the 2010 Best American Sports Writing collection. More recently, the site has been imbibing in the drug called Charlie Sheen, noting his unabashed love of baseball and admiring his ability to hit home runs. You are currently browsing the archives for the Ron Pruitt category.